The bones of “Joe” ready for CT scanning. Dinosaur bones hold some amazing secrets, if we can just see inside. The research team studying “Joe” had some big questions–what did its nasal passages and brain look like? So, they turned to medical science to learn the answer. The skull of “Joe” was sent through a medical CT (computed tomography) scanner–the same machine used to peer inside the bodies of human patients. 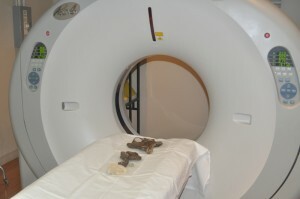 A CT scanner takes thousands of x-ray images, which are then reconstructed on a computer to reveal the inside of a patient (or dinosaur skull). Using special software, the space occupied by the nasal passages and the brain could then be recreated. From the CT scans, paleontologists realized that the nasal passages of “Joe” filled nearly the entire crest. This is pretty unique among the duck-billed dinosaurs, and is one piece of evidence consistent with “Joe” being a Parasaurolophus. This information also allowed them to reconstruct the call of “Joe”. Scientists speculate that crested duck-billed dinosaurs, such as “Joe”, could have used the hollow nasal passages in their skulls as a resonating chamber, something like a trumpet or trombone. A chamber with a long pathway will produce a deep sound; a chamber with a short pathway will produce a sound that is higher pitched. “Joe” had a very short nasal passageway, meaning that it would have produced a high-pitched call as compared to adult Parasaurolophus. Perhaps young Parasaurolophus used their “squeaks” to identify their whereabouts to older animals…we’ll never know for sure! 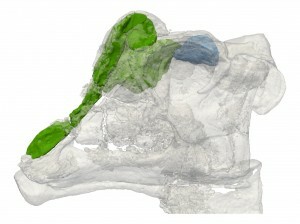 Nasal passages of “Joe” the Parasaurolophus within the skull (translucent). The nose is to the left, and the brain cavity is shown in blue. 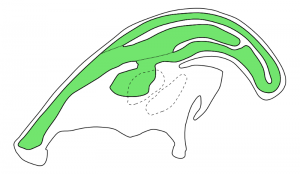 Compare the nasal passages (green) of the adult Parasaurolophus shown here with the nasal passages of “Joe”. Note that they are much longer in the adult–producing a deeper sound.